It's seems as though my two favourite F words, Fashion and Food, have teamed up with designer forces to create a medley of chic meets street. 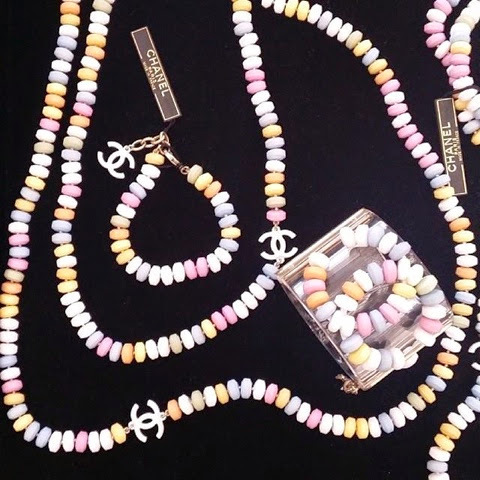 Chanel's supermarket themed runway and Moschino's fast food inspired runway collection has further emerged some delicious looks for the spring and summer seasons! Charlotte Olympia's "Sweet Dolly Pump" serves her iconic platform pump with a sweet twist. A candy inspired ankle bracelet infused with this season's favourite blush and pastel hued tones. For those with a decadent craving of designer goods, powerhouse CHANEL concocts their take on the traditional Chanel pearl double necklace, swapping classy pears for some daytime candy inspired fun. 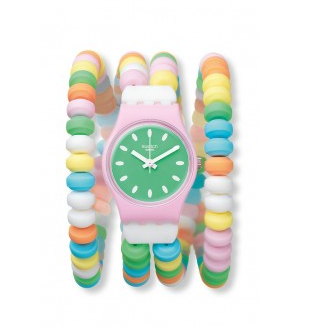 For a sweet tooth fix on a budget, fashion and candy lovers are able to purchase Swatch's Caramellisima Watch for only $60. This is definitely on my craving list!